Romulus 2 is named after the mythical founder of Rome, the centre of one of the greatest empires the world has ever known. A tenuous connection with computers is suggested by the first three letters: ROM is what brings a computer to life. 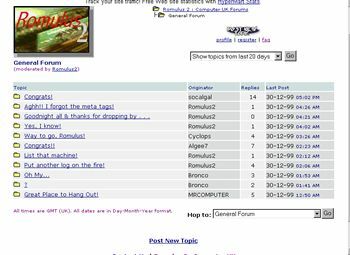 Romulus 2 was registered as a domain (romulus2.com) on the 27th August 1999 and first went online on the 29th December 1999. The Feedback Arena was introduced on the 10th April 2000, with Internet Service Providers as the first category. There was no chart and no ranking, simply a list linked to comments with individual ratings. The next category, Computer Suppliers in the UK, was added on 8th August 2000. This inaugurated the Ranking Chart. It was rather primitive (no verification of users, no minimum reviews for top ranking, no search function) but it was the first of its kind in the UK and attracted quite a lot of interest at the time.